This story begins when Glory Templeton, a seventeen-year-old girl, is told by her mother that she holds the cure to a plague that is wiping out humanity little by little. Raised by scientists, Glory has some understanding of the danger in which she is in–what she does not know, however, is how treacherous her path will become. A YA novel, this one will appeal to fans of Twilight though it does not have some of the qualities that I dislike in the Meyer novels. Unlike Bella, Glory is a forceful character who knows what she wants and acts as a leader of the diverse group that she finds herself in company with. As the plot unwinds, the teenager learns that she is to work with vampires, angels, and witches among other beings and must learn to resolve her own emotional reactions to the events unfolding around her while fighting more personal desires. 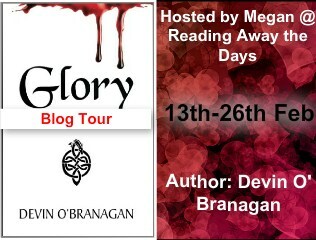 Glory is a well-written, fast-paced novel that sets the stage for other stories in the same universe. O’Branagan introduces supernatural archetypes that slightly twist the usual take on the paranormal, making for an engaging read. This is a book that my own teenage daughters would both enjoy and find confidence in. Glory’s ability to drive her own narrative is reminiscent of Hunger Games’ Katniss although, like most YA heroines, she falls into the trap of romantic complications. This does not prevent her ability to control her own destiny which makes this novel especially interesting to readers who like a little romance with their action. If there was one aspect of Glory that I disliked, it would be a brief reference made early in the book. This reference presents a view of average teenagers as disconnected from the world and so absorbed in their personal dramas (and technological pastimes) that they cannot see the world around them. Personally, I disagree with this generalization; however, this isn’t a fault of the book but rather, the opinion of the reader. Overall, I would recommend Glory (and plan to) to YA readers who crave a little more out of the traditional heroine. Its premise is unique, its world intriguing, and Glory herself has many stories left to tell.